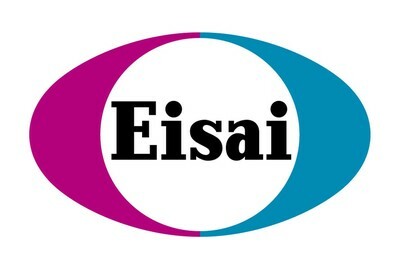 WOODCLIFF LAKE, N.J., Oct. 24, 2018 /PRNewswire/ -- Eisai Inc. announced today the presentation of four abstracts at the 33rd Annual Meeting of the Society for Immunotherapy of Cancer (SITC) in Washington, D.C. from November 9-11. The data to be presented include studies of lenvatinib (marketed as LENVIMA®), an orally available kinase inhibitor discovered by Eisai, in combination with Merck's (known as MSD outside the United States and Canada) anti-PD-1 therapy pembrolizumab (marketed as KEYTRUDA®), for investigational uses in three different tumor types: advanced melanoma, non-small cell lung cancer and urothelial cancer. In addition, Eisai will also present data on the discovery and preclinical development of E7766, a structurally novel class of STING (STimulator of InterferoN Genes) agonists for cancer immunotherapy. "We are excited by the latest preliminary clinical activity observed with the lenvatinib and pembrolizumab combination in these advanced tumor types," said Alton Kremer, MD, PhD, Chief Clinical Officer and Chief Medical Officer, Oncology Business Group at Eisai. "These data at SITC not only show the potential of this combination, but also our unwavering commitment to continue exploring ways to address the needs of patients impacted by difficult-to-treat cancers." 12:20 – 1:50 p.m.; 7:00 – 8:30 p.m.
12:45 – 2:15 p.m.; 6:30 – 8:00 p.m. In March 2018, Eisai and Merck (known as MSD outside the United States and Canada), through an affiliate, entered into a strategic collaboration for the worldwide co-development and co-commercialization of lenvatinib, both as monotherapy and in combination with pembrolizumab. LENVIMA, discovered and developed by Eisai, is a kinase inhibitor that inhibits the kinase activities of vascular endothelial growth factor (VEGF) receptors VEGFR1 (FLT1), VEGFR2 (KDR), and VEGFR3 (FLT4). LENVIMA inhibits other kinases that have been implicated in pathogenic angiogenesis, tumor growth, and cancer progression in addition to their normal cellular functions, including fibroblast growth factor (FGF) receptors FGFR1-4; the platelet derived growth factor receptor alpha (PDGFRα), KIT, and RET. The combination of lenvatinib and everolimus showed increased anti-angiogenic and anti-tumor activity as demonstrated by decreased human endothelial cell proliferation, tube formation, and VEGF signaling in vitro and tumor volume in mouse xenograft models of human renal cell cancer greater than each drug alone. Lenvatinib also exhibited antiproliferative activity in hepatocellular carcinoma cell lines dependent on activated FGFR signaling with a concurrent inhibition of FGF-receptor substrate 2α (FRS2α) phosphorylation. No dose adjustment is recommended for patients with HCC and mild hepatic impairment (Child-Pugh A). There is no recommended dose for patients with HCC with moderate (Child-Pugh B) or severe (Childs-Pugh C) hepatic impairment. In March 2018, Eisai and Merck, known as MSD outside the United States and Canada, through an affiliate, entered into a strategic collaboration for the worldwide co-development and co-commercialization of LENVIMA. Under the agreement, the companies will jointly develop and commercialize LENVIMA, both as monotherapy and in combination with Merck's anti-PD-1 therapy. In addition to ongoing clinical studies of the combination, the companies will jointly initiate new clinical studies evaluating the combination to support 11 potential indications in six types of cancer (bladder cancer, endometrial cancer, head and neck cancer, hepatocellular carcinoma, melanoma, and non-small cell lung cancer), as well as a basket trial targeting six additional cancer types. The combination is not approved in any cancer types today.